Slow day yesterday, but better today, raising 11 sails, landing 4 and a nice dorado. 3 days, raised 63 blue marlin, 2 striped marlin and a sail. They didn't catch anything....just kidding. 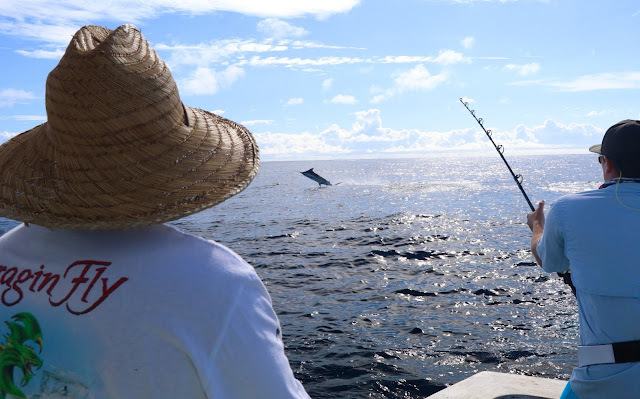 They got bites from 42 of the blues, catching over half of them and the pair of stripeys and the sailfish. We have openings scattered through September if you want to get out there and see it for yourself. This was my last scheduled "Blue Marlin Fly-Fishing School" during my 2017 season, George Maybee my student, had an awesome score. The final score for this trip was 35 Blue Marlin, 2 Striped Marlin, and 2 Sailfish Raised, George caught and released 5 Blue Marlin, 2 Striped Marlin, and 1 Sailfish, all on IGFA 20 pound Class Tippet, on fly. Congratulations to James, Berto, Roberto, and George Maybee who caught 7 marlin and a sailfish all on IGFA rules on fly. day 1 raised 19 blue marlin, caught 3, including Berto's first blue marlin on the fly! day 2 raised 20 blue marlin, caught 2. I have 1 angler looking to sharew with 1 or 2 others, anytime after Sept. 10 to Sept. 30.